Some of the exact same things we do to optimize a website have just the opposite effect when it comes to optimizing our site for franchise sales! Optimizing a site is, of course, extremely important. Some 85% of clicks go to non-paid results – so being on the first page (90% of searchers go no more than three pages into a search) is vital. 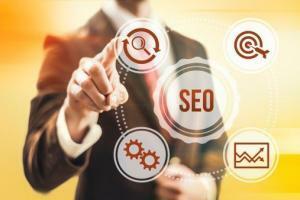 But SEO involves numerous factors – most notably inbound links, keyword density, and the presence of new and original content. And while the algorithms that Google uses in ranking sites are not published, increasingly, those who optimize pages for a living are relying on more content per page to try to drive traffic. Today, many SEO professionals will recommend that you have a minimum of 450 words per page (and some will recommend 1,000+) to optimize your site. But 1,000 words (for those of you who have not yet abandoned this author) is about the length of this article – and that’s a lot of reading for anyone looking for a fast answer on your web page. The longer something is, the more likely the reader is to abandon it before finishing. Lost in all of the SEO hoopla is one simple fact: your goal is not to have people visit your site. It is to have them take action as a result of that visit. But for many websites, the average visit is less than 20 seconds and results in a “bounce” (where your viewer leaves your site without visiting additional pages). That is an epic fail. With all the time spent thinking about adding visitors, we all too often forget to look at SEO from the standpoint of our prospect. They have hundreds of options – so if they do not see precisely what they are looking for in those first ten seconds, they know from experience that they are more likely to find it by returning to their search results than through the further exploration of your site. Moreover, as franchise sales people, we realize that in the early stages of a franchise search, most prospective buyers are not looking for reasons to buy. They are looking for ways to quickly eliminate franchisors from consideration. They have a list of maybe a dozen franchises that they are considering – and they are looking to narrow the list to three. So either way, more content can work against you. According to Microsoft Research’s Chao Lui, who studied more than 2 billion “dwell times” to conduct time-to-failure correlation for webpages, visitors to 99% of all websites will leave in droves during the first ten seconds, and during the second ten seconds, the rate of departure slows only slightly . It is not until after the visitor has been on your page for 30 seconds that the rate of departure becomes relatively flat. After those first 30 seconds, people continue to leave (of course), but at a much slower rate – often staying on the webpage for two minutes or more – a lifetime in the internet world. For a while, people thought that video was the answer to visitor abandonment. After all, people reasoned, video was more passive – so people would watch videos as an alternative to reading. And while videos have changed the way that many people consume information on the web (and, in fact, some 70% of Google searches now return videos in their search results), many of these videos are not optimized for search and most are just plain bad. And, just like those of us who grew up with the TV Remote in hand, the channel gets changed. In fact, one study by researchers at the University of Massachusetts found that 20% of videos had been abandoned after the same 10 seconds allotted to a website. A typical marketing video has an abandonment rate of 35% – 50% after only two minutes. And the longer the video, the less likely it will be watched. Half way through a 10 minute video, for example, the number of viewers remaining will likely be in the range of 30%. The implications of the research referenced above are clear. The first key to holding the attention of your prospects is to grab them by the throat in the first 10 to 30 seconds. Often, the key to this approach is to target your page for a specific reader and focusing on the content and the value proposition that will have the most relevance to that reader. The use of specific landing pages can be tremendously helpful in this regard – but exercise caution – too much duplication of content between landing pages can create penalties with search engines. With the explosion of content on the web, patience is no longer a virtue our prospects can afford. So unless you can cram your entire message into a brilliant 20-second elevator pitch (and which of us can? ), you have to find a way to engage your audience and draw them into your story. The best authors compel us to read further by making us care, by painting us into the picture, and by leaving us wanting more. If you cannot do that in 20 seconds, find a writer who can. Professionalism is no longer an option. Today’s prospects will not waste their precious time on a website designed by your 16-year-old niece or a head-and-shoulders video shot on your camcorder. While budget may be an issue, remember that each incremental franchise sale that results from more professional communications will equate to franchise fees and royalties that may be realized over decades to come. Calls to action – along with a well-defined value proposition – are essential both in your web and your video communications. Providing your prospect something of value – whether it is a white paper, a video, or an e-book – will improve your lead capture rates and increase the effectiveness of your advertising, social media, and your franchise SEO activities. In the end, attention is the new currency of the internet. Fail to capture and hold your prospect’s attention, and you will become a victim to the ruthless internet triage that has become the order of the day. But hold their attention for 30 seconds, and you may just get rewarded with a relationship that lasts decades. Mark Siebert is the Chief Executive Officer of the iFranchise Group and is on the Board of Directors of TopFire Media (www.topfiremedia.com). Their combined consultants have over 500 years of experience in franchising and have worked with 98 of the nation’s top 200 franchisors. He can be reached at 708-957-2300 or at [email protected].